“Raw” is a term that gets thrown around a good deal in street photography. Not RAW as in the digital file, but as a term used to describe a style of street photography. But what is raw? Is it gritty? In your face? Is it shot with flash? Is it an “untouched” image? Is it less artistic? Any of those things can indeed be components of a raw street shot. However, in my book, raw is more of a feel. It’s not a thing that’s easy to describe, but it’s easy to identify. It may be easier to point out what isn’t raw. Raw wouldn’t necessarily be used to describe Henri Cartier-Bresson’s work. Or Elliott Erwitt’s. Or Brassai. Raw isn’t what most folks would consider pretty. It’s more documentary in style than artistic. Raw is “warts and all”. Raw can be unsettling, uncomfortable. Raw can take us to places we wouldn’t think of going to, maybe because of the reputation. Because of fear. In instances like that, the photographer becomes a guide, taking us through these places and bringing us out unscathed physically, but maybe not mentally. Over the last decade, one of these guides has been the seemingly fearless Vladimir Milivojevich, otherwise known as Boogie. The Serbian-born photographer has been featured here before in Under The Influence and his background is as intense and fascinating as the work that he does. 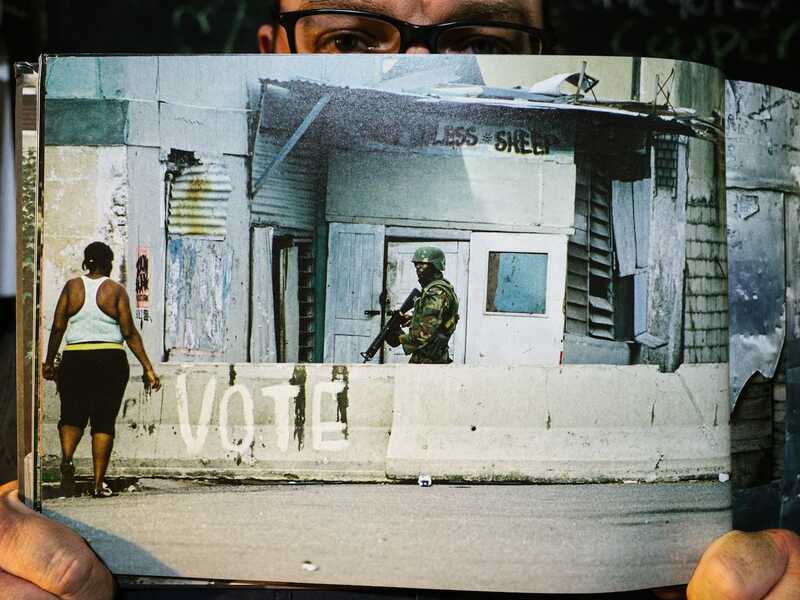 Born and raised in Belgrade, in 1969, Boogie began photographing his war-torn country in the 1990’s. His website (www.artcoup.com) says, “growing up in a war-torn country defined Boogie’s style and attraction to the darker side of human existence.” A look through his previous work, only solidifies that. Since being granted United States residency in 1997 via the country’s Diversity Immigrant Visa lottery program, Boogie has had six books published and shown the world rawness many are insulated from. Drugs, gangs, and guns may be what hit the observer of his work the hardest, but Boogie’s work is more than shock value. Though it is hard to argue that a gun pointed towards the camera is hard to top, Boogie gives us more than that. More than collections of gut-punch images. 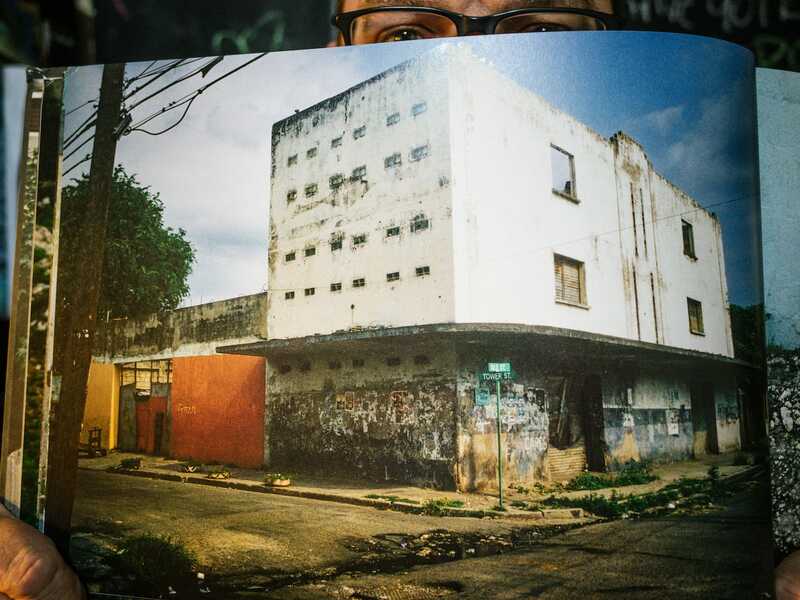 His projects are an experience, a blend of documentary and street that put the viewer in the thick of it all, but with far less shakier footing than we likely would have. 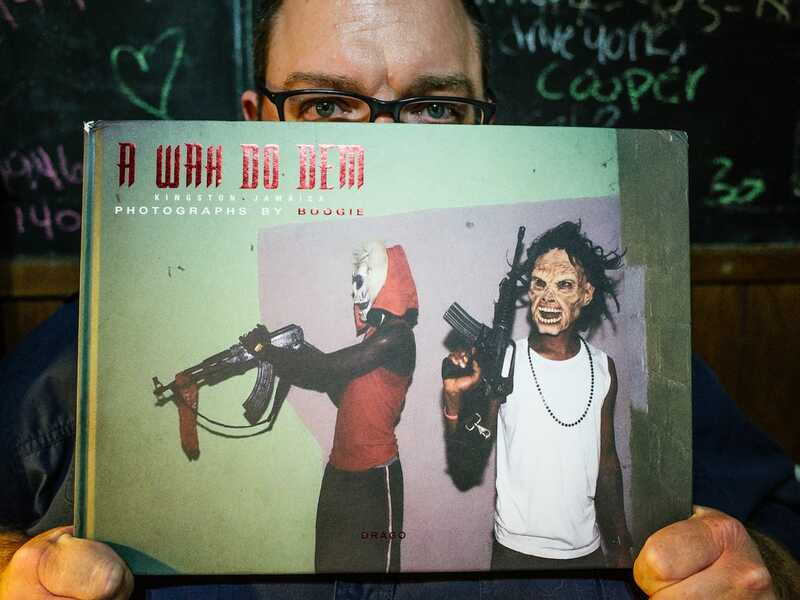 Boogie’s latest book, ‘A Wah Do Dem’ (Drago, 2015) builds upon the photographer’s rock-solid body of work with one notable exception. Unlike his previous projects, this is given to us in truly glorious color. 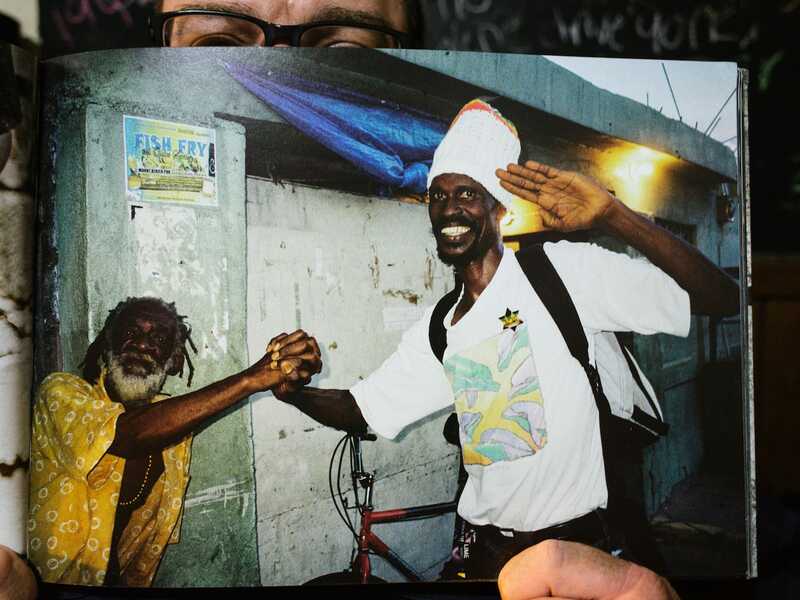 With Kingston, Jamaica being the focus, color was undoubtedly the route to take. Testament to this comes with first viewing the cover, with two gangsters in horror masks, brandishing assault rifles in front of a green and purple wall. The tone is set from the get-go… tighten your laces and crack your neck, because this isn’t going to be a sightseeing tour. Like any major city, Jamaica’s capital has it’s fair share of crime, and the cover of ‘A Wah Do Dem’ not so subtly hints at that. Statistics show, that as recent as 2015, Jamaica had one of the highest (per capita) national homicide rates in the world. 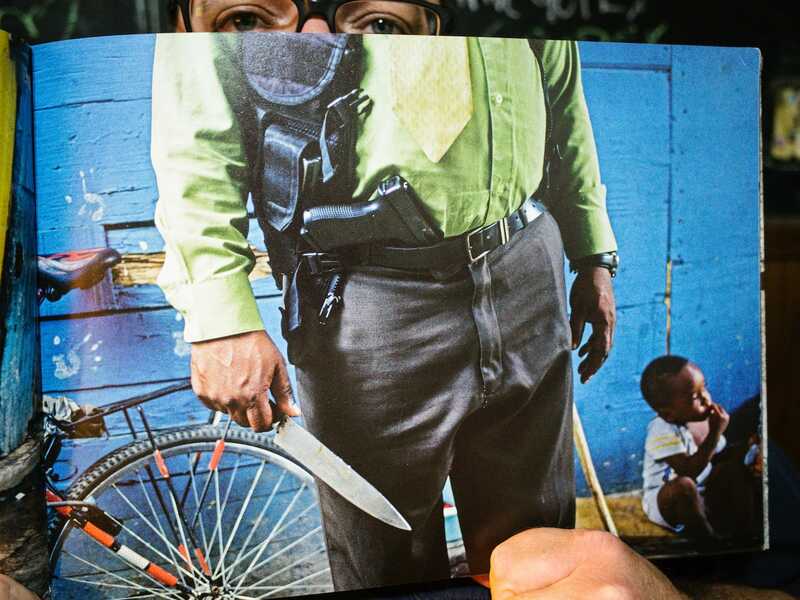 2014 saw Jamaica posting its lowest homicide rate since 2003. However, 2015 saw a 20% spike in those numbers, with approximately 45 slayings per 100,000 people, according to the Jamaica Observer. Last year, Kingston had 132 homicides. Though the island is a vacation destination, visitors are frequently told not to wander from the popular all-inclusive resorts because of the crime. Boogie cites something similar in his introduction. Clearly, Boogie thrives in this environment. 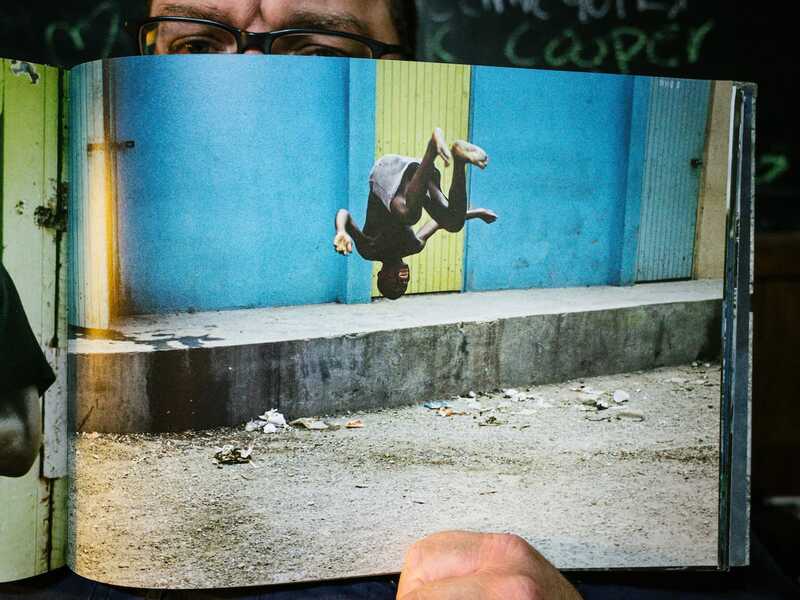 Leafing through A Wah Do Dem’s 124, full-bleed pages it becomes clearer yet that Boogie the photographer needs to be there, or maybe even belongs there. A dangerous hybrid of documentary photographer and adrenaline junkie, Boogie takes the reader into the Kingston that the vast majority of us will never know and does so intensely. Because having the stones to document in this style wouldn’t matter if Boogie wasn’t a good photographer. And make no mistake, Boogie is a great photographer. 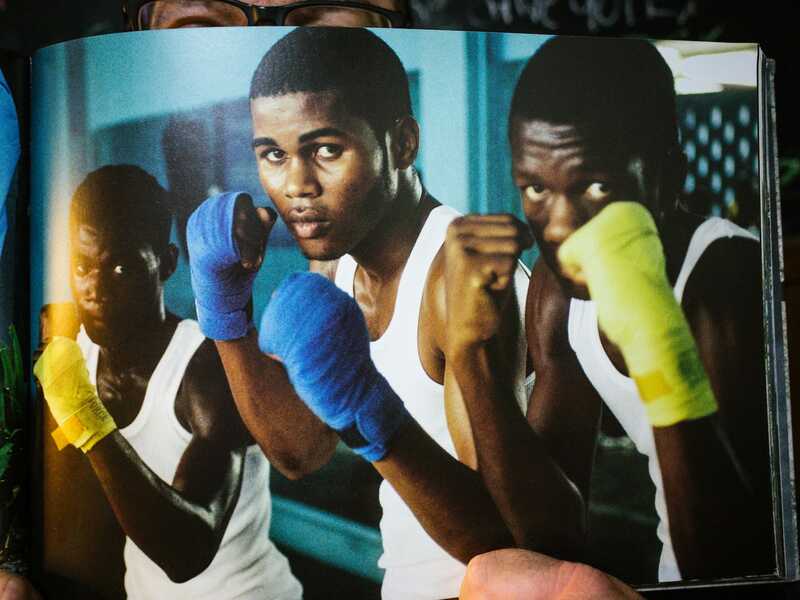 ‘A Wah Do Dem’, at 13″ x 9″, is a wide book best viewed on a tabletop, and it leaves a lasting impression. Most impressive, is that it loses no impact after repeated viewings. If anything, a stronger bond has been formed between myself and the book. A familiarity with the images seems to pique more curiosity about Kingston, the people that live there and even Boogie himself. Though the cover, with the masked gangsters, is an intense image that appears to use Kingston’s criminal element as the “selling point” for the book, it would, in itself, be criminal to say that this is what ‘A Wah Do Dem’ is all about. It quickly becomes clear that these images from moments in the fringe, only drew Boogie deeper in and closer to Kingston and its residents. Maybe even closer to it’s “soul”. And it also becomes clear that Boogie earned these people’s trust, and shooting there became more than just a thrill for him. Trust makes stronger images and generates empathy. For the viewer, and obviously, for the photographer. The Kingston that Boogie shows us is not a wealthy one, but there is no feeling of exploitation when turning through the book. There’s portraits that connect with us as if we were snapping the shutter ourselves. The men, women and children captured in his lens are not in this book because they’re living poorly. It’s because they’re living. Living, laughing, dancing… in neighborhoods that have likely seen better days. Amongst run-down husks of buildings and washed-out colors, that are still somehow vibrant. On broken streets. In a boxing gym, working out in synchronicity or striking a classic pugilist’s pose. Boogie also manages to make us feel the neighborhood itself. Mixed in with the portraits and street scenes are superior street scapes. The buildings mentioned previously. Graffiti. Flyers. Big, wide shots that, in their breadth, succeed in not pushing us further out as an observer, but in drawing us closer. And they complement the closer, more “raw” shots. The images between the hard covers sequenced to make ‘A Wah Do Dem’ an immersive trip. But immersion means we truly have to go all in with Boogie. Any shock, and ensuing curiosity, felt with the cover must be explored. Masked gangsters. Close-ups of well-worn guns. Drugs. We get a photographic taste of the adrenaline rush Boogie must have felt when gaining access to the life of crime. And, we also get the other side of the law. Boogie was able to shadow undercover officers while searching and making arrests. Then there’s a military officer, armed and facing a woman on the street while standing behind a concrete barrier with “VOTE ” spray painted on it. Above him, painted on a wall is “GOD BLESS SHEEP”. The tension is palpable. So very real and it’s there… on the page where we can see and feel it from a safe distance. Boogie knows how to use graffiti and signage to help make an image hit even harder and he does it on a few occasions in ‘A Wah Do Dem’. Reflecting, images like this illustrate his commitment to capturing the Kingston he came to know as honestly as a photographer could. That strength felt through the photographs is very, very impressive. There’s passion in Boogie’s work, and a single journey through ‘A Wah Do Dem’ proves it to the reader. It’s obvious Boogie craves the action, the danger. But satisfying that craving is not totally self-serving. If Boogie wasn’t passionate, these images wouldn’t connect like they do. The Impact would surely not be as strong. His style of photography sticks to your ribs and burns itself into your brain. Street and documentary often collide, and often the result seems distant. Cold. Boogie defies that here. This Kingston may not be the paradise we envision in Jamaica. But it is home. And home can be paradise to those who live there. To those who try and protect it. And to those who try to carve out their own little chunk of it by whatever means they can. Lucky for us, we have a highly skilled shooter like Boogie to capture it and bring it closer to us. A Wah Do Dem is big and bold. Both brash and beautiful. A new volume and a new excursion into color by a greatly skilled photographer who is continuing to build on an already rock-solid foundation of work. At $38 US on Amazon, this book is worth every penny. It is an engrossing experience that will have you pulling it off the shelf many, many times.